Hidden Shoal is excited to bring you A Smooth Sea Never Made A Skilful Sailor, the new EP by Australian experimental/ambient duo Gilded. 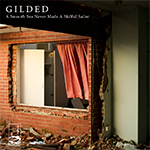 Following on from the release of their critically acclaimed debut album Terrane and its accompanying national tour, Gilded’s new EP A Smooth Sea Never Made A Skilful Sailor brings together three previously unreleased and essential new tracks. ‘38 Degrees (Live at The Bird)’ is a beautiful live improvised guitar-based work, rich in textural details, contrasting markedly with the more piano-focused pieces on Terrane. Shoeb Ahmad (of Canberra outfit Spartak) remixes 2012 single ‘Cluttered Room’, dissecting the bassline, banjo and melodica and tethering them to an itchy breakbeat, surrounding the mix with an otherworldly vocal. Hidden Shoal’s very own perth also take on ‘Cluttered Room’ in their own inimitable style, creating an ebbing electro-acoustic micro-environment set adrift in clouds of reverb. A Smooth Sea Never Made A Skilful Sailor is available for free download from the Hidden Shoal Store and can be streamed over at SoundCloud. Be sure to check out the wonderful work of Shoeb Ahmad/Spartak and perth while you’re at it.